Barter Books : Allingham, William : Sixteen Poems By William Allingham. Selected by William Butler Yeats. Limited Edition. 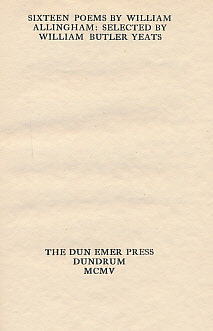 Dun Emer Press. 220 x 150 mm (9 x 6 inches) - 35pp. Cloth spine on grey paper-covered boards.